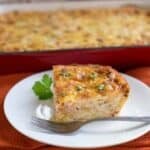 This low carb breakfast casserole takes only 10 minutes of prep time and is loaded with bacon, eggs and cheese. It’s a minor miracle it only has four grams of carbs per serving. Casseroles … they’re not just for dinner anymore. 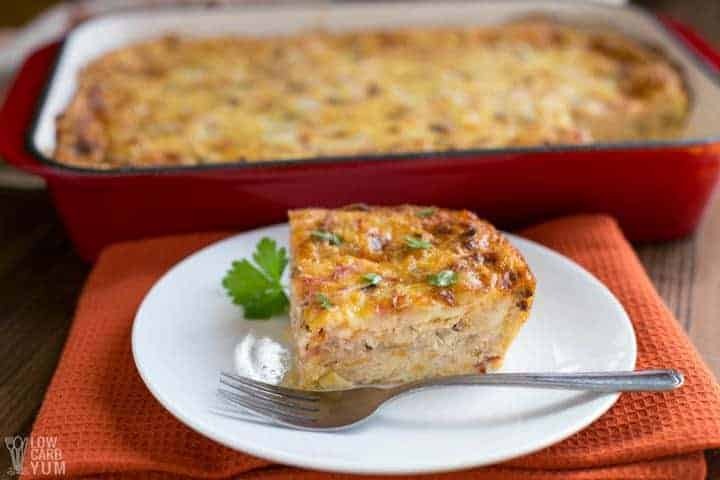 Long gone are those Sundays when mom would dish up her almost-world-famous tuna casserole. There’s also the ground beef taco variety that’s immensely popular. So, too, is are the myriad mac ‘n’ cheese variations. But for breakfast? You bet. 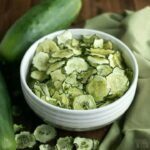 My family loves this recipe. Now, for a normal family of four, this recipe would last a solid week. With my perpetually hungry son (I should check him for tape worm), my wrestling-coach husband, who still has the same voracious appetite he had when he was Connecticut’s first 4-time state wrestling champ, and two daughters who have their own healthy appetites, this lasts, oh, maybe 10 minutes. Nonetheless, I love making it for them. It’s quite easy. So let’s get to it! Make sure you have the bacon and onions chopped ahead of time. Same goes for the one pound of Swiss cheese that this recipe calls for. The radishes and cheddar cheese you’ll want to shred. Get out your dozen eggs. Make sure the eggs are finely beaten. Now that all your ingredients are out, let’s make some bacon. Bacon? Yeah, why not? If you’re new to my healthy cooking blog, perhaps you’re thinking that bacon is an artery-clogging heart attack waiting to happen? 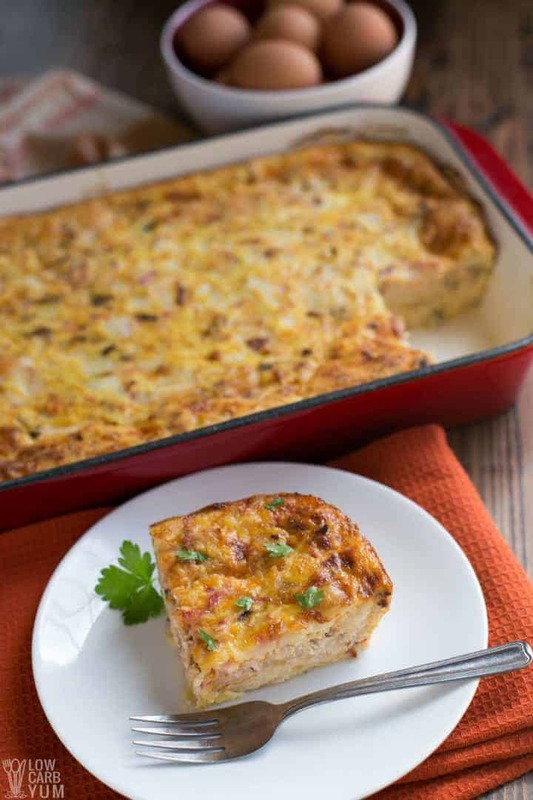 Can a healthy casserole have bacon? Yes. Not all meat is created equal, of course. Factory-farmed food is terrible for your health. And even though organic or natural bacon free of nitrates/nitrites might be significantly more expensive than conventional brands, it’s worth every penny. Occasionally eating organic bacon won’t harm your health. Your cardiologist might disagree, but that’s my opinion. And if you exercise some will power and just stick to eating one pie slice, the amount of bacon is actually minimal. 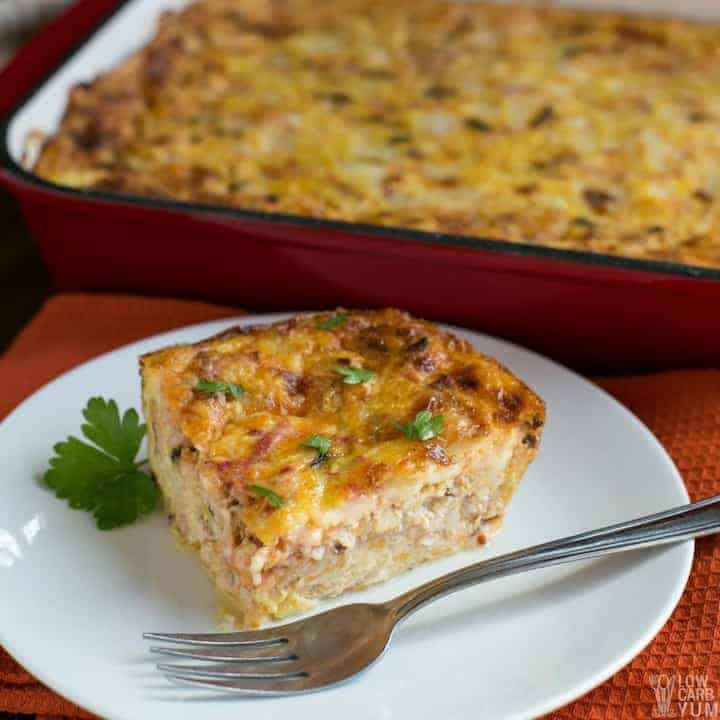 The natural fat from the eggs and cheese in this low carb breakfast casserole will fill you up so you probably won’t have room in your belly for a second serving. Now that your mind is more at ease about bacon, cook it with the onion over medium-high heat in a frying pan. You can choose whatever you prefer to coat the frying pan with. Personally, I like Spectrum Naturals coconut spray oil. You can also experiment with avocado oil. It has a high smoke point so you don’t have to worry about the food overcooking. And even though the name “lard” conjures the unhealthiest image of dietary fat, it’s actually quite healthy to coat your pan with it. That’s because natural lard (not the hydrogenated variety, which is unfortunately, the most common) is highly resistant to spoilage. If you have a concern about its effect on your arteries, obviously you don’t want to eat a huge spoonful of it. But a little dab will do ya for coating the pan. Once the bacon is fully cooked, drain any oily residue. Try to make the onions and bacon as completely dry as possible. Next, in a large bowl, combine the bacon and onion with the radish, and the three cheeses. Speaking of lard, it also makes for a great greasing agent for a casserole pan. 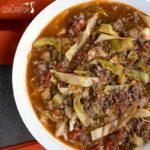 For this recipe, I use a 9 x 13-inch pan. Pour the mix into the pan. Then place the pan into the oven at 350 degrees. The eggs should set after about 45 minutes or so. You can turn the oven off and let sit for about another five minutes or so if you like it well done. 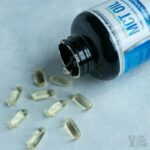 Some people who are new to the ketogenic lifestyle wonder if they’re doing more harm than good by eating foods that contain lots of cholesterol. True, you can be a vegan and still be keto. 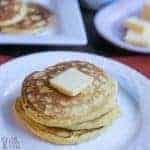 However, it’s much easier for most people to avoid high-glycemic foods when you can eat dietary fat from animal sources. Yes, cheese and bacon contain cholesterol. But cholesterol might not be the dietary villain doctors have painted it to be over the last several decades. In fact, the federal government’s top dietary experts recently announced that cholesterol is no longer a nutrient of concern. Some people might have to monitor their cholesterol intake more closely because of genetic factors. However, for most people, eating foods that have cholesterol will have negligible impact on serum cholesterol levels. 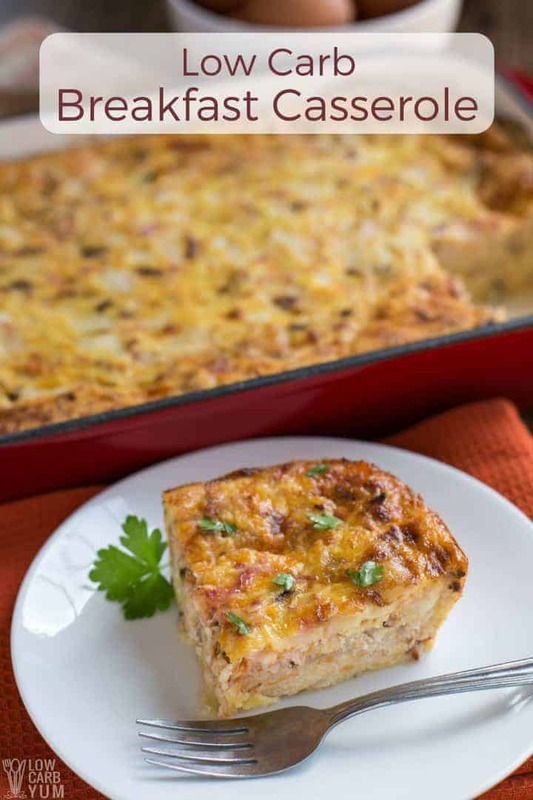 Believe me, as a mother of three, I wouldn’t be feeding this low carb breakfast casserole to my family if I thought it was unhealthy. The number one nutrient of concern for health experts should be carbohydrates, not natural sources of dietary fat. And if you’re reading this because you realize the benefits of not eating foods that spike your blood sugar, you’ll be glad to know that this casserole contains only 4 grams of carbs per serving. Compare that to this popular chicken casserole dish. 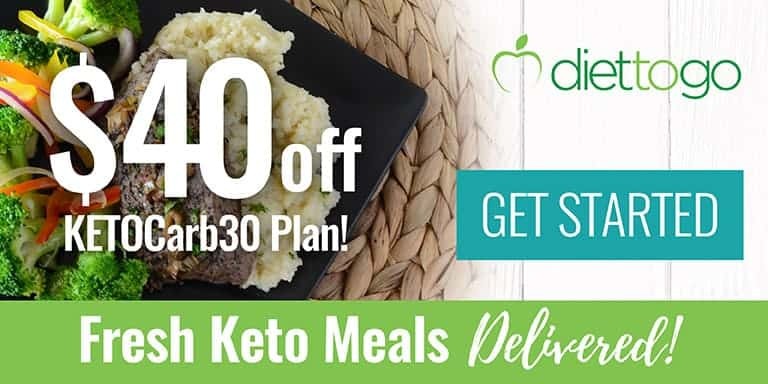 It contains 30 grams of net carbs. The rise in insulin levels, which occurs when you eat high-carb foods, can raise cholesterol levels in your blood for the worse. That’s what doctors should be focusing on! 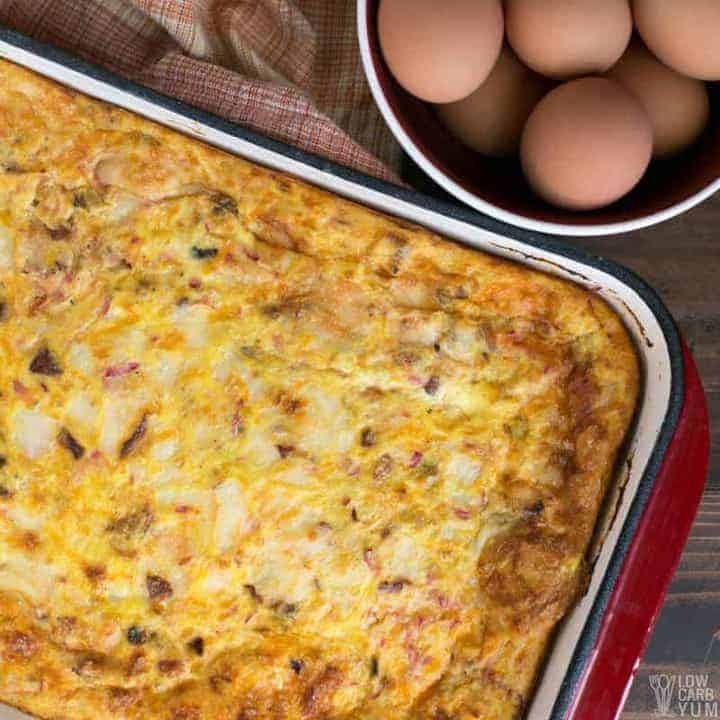 So for here on out, I’ll be dishing up this bacon and egg casserole to my family with pleasure. Even if they devour it within minutes and barely utter a grunt of thanks. 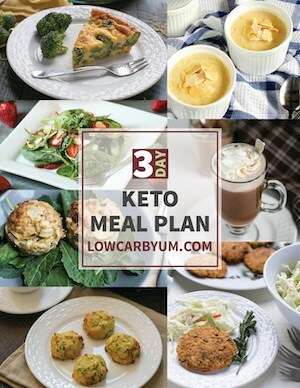 Feel free to check out my other healthy keto casserole recipes here. 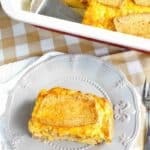 Enjoy this family friendly egg casserole! 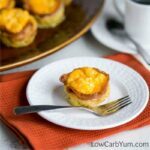 This keto friendly breakfast bake takes only 10 minutes of prep time and is loaded with bacon, eggs and cheese. 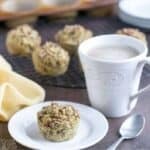 Plus, it only has four grams of carbs per serving! Cook bacon and onion over medium-high heat until bacon is fully cooked. Drain. 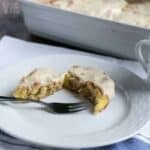 In large bowl, combine bacon, onion, radishes, eggs, cheddar, ricotta, and Swiss cheese. Pour mixture into greased 9x13-inch casserole pan. Bake at 350°F until eggs are set (about 45-50 minutes). Turnips could be used in place of the radishes if desired. 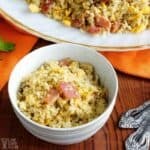 Leftover ham can be used in place of or in addition to the bacon. 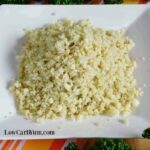 Cottage cheese is a great sub for the ricotta cheese. Sour cream or yogurt may work too.